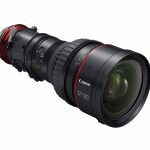 Originally hinted at during last year’s NAB, Canon was proud to introduce the Cine-Servo 17-120mm T2.95 zoom lens at NAB 2014. 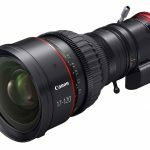 Canon’s Chuck Westfall describes the Cine-Servo Zoom as a balance between “the lightweight SLR lenses and the heavier Cinema EF lenses”, citing its 17-120mm T2.95 servo zoom as the reason. Westfall notes that the Cine-Servo Zoom is extremely versatile, and is great for anything from ENG work to film and beyond. 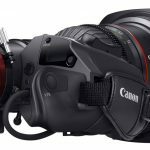 Canon is also making the lens in both EF and PL mounts, leaving you more options for its use. 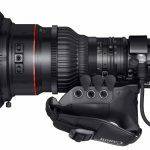 They’ll even offer a lens conversion service (for an additional charge) to swap the mount for you should you need to switch to another camera. While versatile, the Cine-Servo Zoom is also powerful and fully covers a Super-35 sensor. MELVILLE, N.Y., April 2, 2014 – Shallow, creative depth of field, high-resolution and optimal low-light shooting capabilities are just some of the many reasons that large, single-sensor digital cameras have been kitted and rigged for use in nearly every application involving video capture. 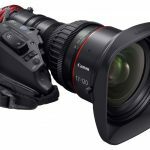 Further enhancing the versatility and adoption of these cameras into markets such as ENG (Electronic News Gathering), documentary, narrative production and special event coverage is the new CINE-SERVO 17-120mm T2.95zoom lens from Canon U.S.A., Inc., a leader in digital imaging solutions. 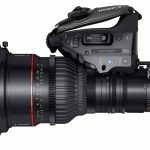 Designed to perform in a shoulder-mounted application or as a traditional cinema lens, the Canon CINE-SERVO 17-120mm T2.95zoom lens has an ENG-style Digital Drive handgrip with zoom rocker switch, which can also be detached to allow for manual cinema operation. The new CINE-SERVO lens features high 4K optical performance throughout the broad focal length of 17mm to 120mm within its compact and lightweight body, a three-group inner focus system to help minimize focus breathing and provide a stable angle of view, an 11-blade iris to help achieve creative depth-of-field manipulation andnatural “bokeh” background, user-friendly design features, support for matte boxes, follow focus and other accessories, and rugged reliability. Designed to work with single-sensor cameras, the lens will be available in either PL- or EF-mount.